Energy and the Environment-A Coastal Perspective - Response: Is Banning Plastic Straws a Viable Solution? An interesting point is brought up by Bobby in the original post regarding the plastic straw debate. Yes, they end up in our oceans and are harmful to marine organisms but they are also necessary for the aid of those living with disabilities. Alternatives to plastic can still be hazardous to those who need straws, can be lower in quality, and are generally more pricey. The straw ban may even have economical issues- bubble tea shops in San Francisco rely on the use of straws to consume their product and are scrambling to find solutions for their stores if the straw ban gets enacted (Kauffman, 2018). So maybe a plastic straw ban is a little extreme, at least until we find a suitable replacement. The major issue is that we don’t have a sustainable replacement, at least not now. Most biodegradable straws are made from polylactic acid (PLA), a material that can only be broken down under high heat (Kauffman, 2018). This means that the straws need to be sent to an industrial compost facility in order to be degraded. Many towns do not have these composting abilities, much less the ocean. These straws would continue to remain a threat if they entered the oceans. 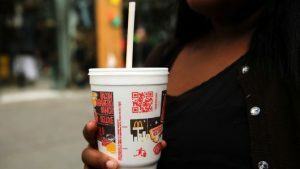 There are other materials available to create bio-degradable straws but they are less developed and more costly. However, I believe that plastic straws might not even be the most detrimental source of ocean pollution. 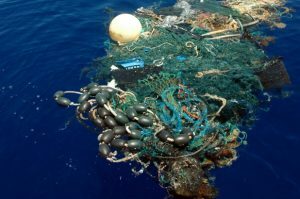 A team of scientists analyzed the Great Pacific Garbage Patch to understand what plastics it is composed of and found that fishing gear made up the majority of this trash. Fishing gear in particular has a detrimental effect on marine organisms because it is designed to trap them, preventing escape and increasing their chances of injury or death.About 46 percent of this garbage were fishing nets alone (Parker, 2018). This didn’t even account for other fishing gear, ropes, traps, and crates which also made up a significant portion. Another 20 percent of the trash pile consisted of debris from the 2011 tsunami that hit Japan (Parker, 2018). However, this only represents ocean surface pollution and even more plastic is predicted to be within it’s depths. The straw ban generates a lot of issues for many businesses and folks living with disabilities and it may not even reduce a significant amount of ocean plastic pollution. While I fully agree that we should opt out of straws when we are able, this is also a difficult practice to monitor. As of now, the best solution would be to provide straws on request instead of enacting a full ban. This is quite a disappointing issue but hopefully a technological breakthrough will help solve this problem. Comments Off on Response: Is Banning Plastic Straws a Viable Solution?